It all happened so quickly! Horace's ankles are locked in chains, preventing him from rescuing his terrified mother as she is dragged away by their captors. She has only seven days to return with the answer that could save her son! During her absence, Horace is held hostage in their dark cavern and wonders if he'll ever escape. Through a risky venture he learns that God's light can penetrate even the darkest evil. The Robbers' Cave is a breathtaking family experience! From Tracey of Honeoye, New York on 12/2/2015 . I read this aloud to my 9yr old son, and we loved it and hung on every word. Many nights we read past "bedtime" because we couldn't put it down. My 12 yr old also read it on his own and enjoyed it. This is a keeper that I'll want to reread and recommend to friends! From JOHN PEDERSEN of Ellettsville, Indiana on 7/14/2014 . Wonderful book of God's providential working in the lives of humanity. Very descriptive of how mankind takes God's words and works for granted and how He gets our attention in adversity. Very descriptive of the topography of southern Italy. From Heather of El Paso, Texas on 7/29/2013 . Any book written by A.L.O.E. 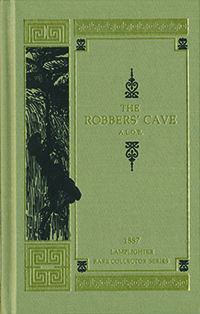 is bound to be good, and The Robber’s Cave is no exception. In this exciting book full of outlaws and dark caves, Horace Cleveland learns to trust God, honor and respect his mother, and comes to realize his duties as a “sworn solider of Christ”. While in the Robber’s Cave, Horace meets and is befriended by the brother of one of the outlaws, Raphael, who I personally think is one of the most significant persons in the whole story. Raphael is a wonderful role model, his loving kindness for his wayward brother is very touching and his faith in God is unshakeable. I highly recommend this book to anyone who loves a good story. Both boys and girls, men and woman will enjoy it and learn from its pages!